Ingredients: wheat protein (Russia), extra-first cold pressed olive oil (Greece), sunflower oil (Krasnodar), spicy and aromatic blend “Doctorskaya” (extracts and spices: muscat, allspice, cardamom, maltodextrin), sea salt, seaweed polysaccharides, inulin from chicory, natural dye “beetroot”, carrot fiber. 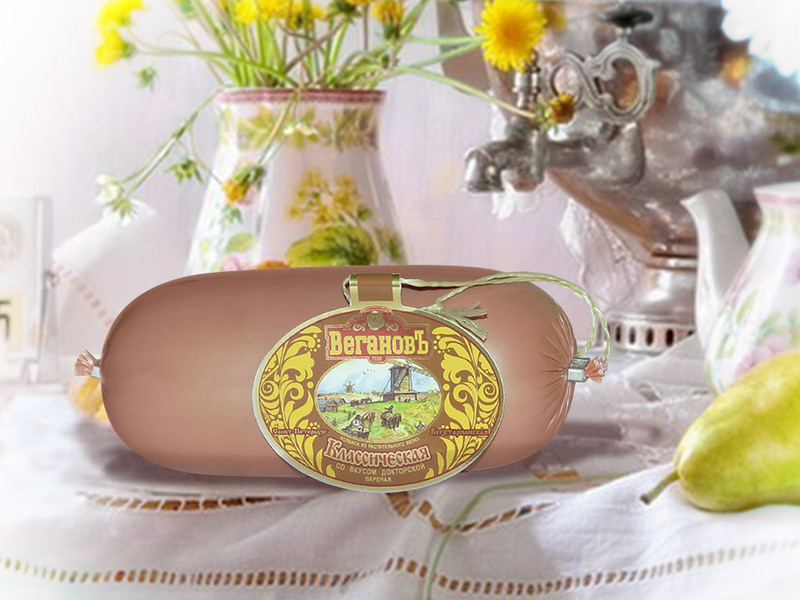 A distinguishing feature of vegetarian sausages of the brand “Veganov” is the presence in the composition of ingredients and additives with improved biological and nutritional value. Also there are such useful additives, included in the composition of the sausages, as inulin – daily usage of inulin as a prebiotic leads to substantial increasing of the number of bifidobacteria in the gut, thereby improving the intestinal flora by inhibiting the development of pathogenic viruses and fungi, respectively increasing immunity; seaweed polysaccharides contain a complex of biologically active substances and minerals (K, Ca, Mg, S, Si, P, J, Fe, Ba, etc. ), the spectrum of vitamins (A, B1, B2, OT, B6, B12, C, D E, K, P, H et al. ), rich in organically bounded iodine and selenium; sea salt is also rich in minerals necessary for the body; carrot, fiber ensures uniform absorption of carbohydrates and fats, lowers cholesterol and blood sugar, cleanses the body of toxins. Fiber is an essential component for the digestive tract. The composition of a vegetarian “Doctorskaya” sausage includes cold-pressed olive oil, which is rich in Omega-3, oleic acid, vitamins. Fatty acids Omega 3 group. As soon as the omega-3 fats fall into the organism, they infiltrate directly into our cells, affecting their structure and activity. And because of it these acids have such a variety of useful properties. The effect of omega-3 on blood vessels and heart is the best studied: they reduce the content of harmful fats in the blood, prevent the formation of blood clots and the development of inflammation in the blood vessels, thereby protecting against heart attacks and strokes. Omega-3 fatty acids have a positive effect on mental state, eliminate depression and prevent age-related decline of cognitive and mental abilities. Oleic acid belongs to the group of Omega-9, one of the major essential fatty acids, without which a proper metabolism in humans is impossible. The most amount of oleic acid is contained in olive oil, which is so much appreciated, because oleic acid is well absorbed by the body. Vitamin K is necessary for the formation of blood coagulation factors. It is also important for protein synthesis in the blood, bone and connective tissue. Vitamin E prevents oxidation of fats, that enter with food, and turn them into aggressive free radicals. It strengthens blood vessels, muscles and nervous system, it is necessary for recovering of cells.